Qualify as a Professional Chartered Accountant. Our Level 7 Accountancy and Taxation Professional Apprenticeship aligns to qualiﬁcations from leading industry bodies. Why is the Level 7 Apprenticeship perfect for you and your employer? • Qualify with a choice of top professional qualiﬁcations including ACCA, CIMA and ICAEW • You can join this programme at any entry point even if you have exemptions • Your training costs are covered by Apprenticeship Levy payments or funded up to 90% for a non-levy paying business As an award-winning training provider, BPP delivers a range of apprenticeships to six of the nine major UK banks and eight of the top ten professional service ﬁrms. Tutors, are you spending too much time checking “10” = “£10.00”? the workplace. This is one reason employees are advised not to listen to loud music at work – just imagine the sight and sounds that are blocked with this device! You have to be aware of what is going on in your environment. There can be more human ways of handling office distractions and managing our time. Mustafa Yusuf-Adebola, by email The editor says: And you don’t even mention the price – these sensory blockers will set you back £200! So are we becoming a nation of zombies? Let us know. There was a great chat about how you choose a business name on Accounting & Bookkeeping Support (AAT, ICB, Students & Qualified) too. Miranda Toppin was going to call the company MJT Accountancy, but wasn’t 100% sure. Jenny Waller used the name of a street she used to live in and Coral Rogers looked up her initials in the periodic table and came up with Chromium Bookkeeping. Chromium is nice and shiny and she likes shiny things! GET THE ACCA EXAM RESULTS YOU DESERVE The most flexible and engaging ACCA courses available, with everything you’ll need to pass the first time - tuition, revision, mocks, pass guarantee – you can be confident that our approach is your best chance to ACCA success. Start studying towards your next sitting with an award-winning ACCA course. were ‘fairer’ this sitting. These papers had some of the worst pass rates last time around, so students and tutors will hope to see an improvement on the 38% and 31% December rates come 15 April. The APM December pass rate was 33%, and time was again the enemy for many. There were, however, few complaints about the Spring test. PM got a more mixed reaction. Parts A and B were mostly OK. It all depended on what questions you got in section C, and there was a lot of question envy on the noticeboards. • See www.pqmagazine.com for all our exam feedback. Cheers! Keith Windross told us he “had to find an innovative solution to recover from ATX”. Seems to be working, he said! disappointing news and would like to apologise for any distress this may cause. In recognition of the inconvenience caused we have applied a further £30 goodwill gesture to your MyACCA account.” We wondered if this was an isolated incident and would love to hear from any students who have suffered a similar fate. Contact PQ in confidence – email graham@pqaccountant.com with your story. Training contracts on the increase The number of trainees on contracts with the UK’s top 75 accountancy firms is approaching 20,000, says new research from Accountancy Daily. The survey found that there are currently 19,887 trainees studying to become qualified accountants, tax advisers or consultants at these top firms. This represents a 4% increase on the corresponding figures for last year. 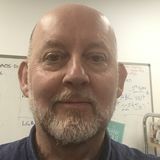 Workload blamed for tragedy The widow of an accountancy lecturer who killed himself has said her husband, Malcolm Anderson, was unable to cope with his workload. The deputy head of accounting at Cardiff University fell to his death from a university building in February last year. The inquest was told he left a note describing the pressures he felt from his job and long hours. critical in today’s digital world and the same is true of the qualifications you hold.” He admitted that, like many others, he takes pride in the certificate hanging on his wall – but you cannot take it down and share it when you need to. However, the demand for verified, trusted and irrefutable identities from many different types of organisations is rising. Potential employers, in particular, want to ensure that an applicant holds the credentials listed on their CVs. exam requires. Students are also showing the examiner which questions they are struggling with most. The examiner said: “Mostly, candidates answered the questions in order. Where they did not they appeared to be leaving one question, which they liked least, until the end.” trialing The concern here is that in future exams the examiner has said the questions may follow a timeline or have question requirements that progress in other ways. That means you are getting a direct recommendation to answer the requirements in order. once centres are accredited to host exams by AAT, how often they are visited to ensure they are providing a proper service and keeping their software up-todate. PQ would like to hear from any other students who suffered a similar fate. Send your stories to graham@pqaccountant.com. to boot. He added another £100k to his bank account with the UK Open prize money. intended to be used for criminal purposes. The accounts are held mainly by overseas students studying in the UK, who may be unaware that operating a bank account in this manner is potentially illegal, said the NECC. Code rejig The FRC is looking create a new Stewardship code, setting out more rigorous requirements for reporting. The code will refer to environmental, social and governance (ESG) factors. Signatories are also expected to take material issues into account when fulfilling their stewardship responsibilities. And investors must report how their purpose, values and culture enable them to meet their obligations. week six. The recommendation is that you sit the exam within three weeks of finishing your course to maximise your chances of passing. Students who attempted both short tests and mock exams had 5% higher pass rates than those who did neither. However, when you sit exams has no affect on pass rates. Apparently, there isn’t a ‘lucky time’ to sit exams. The researchers also wondered if exemptions influenced pass rates. Again, the short answer is no – exemptions of five or less make little difference to pass rates. LSBF moves into Vietnam LSBF in Singapore has announced a new agreement with iBosses, Vietnam. The collaboration will start with the launch of online ACCA programmes, and the long-term goal is for LSBF to offer both online and on-campus ACCA programmes to multiple countries in the region. Rathakrishnan Govind, LSBF Global CEO, said: “Vietnam is a key destination for LSBF because of its large youth population and keen interest in quality education offered by overseas providers. We believe it is the right time to introduce LSBF’s delivery models, which are suited to the fast-paced and challenging environment our students are experiencing.” As part of the agreement, LSBF Singapore will provide all the ACCA online content and study guides as well as international teaching resources, while iBosses Vietnam will provide the necessary resources and facilities for training projects and student management. automating their financial processes. They also think they will be able to gather data faster, and at a lower cost, than external accounting firms. Source’s Fiona Czerniawska said: “When clients decide to split a professional service it paves the way for change in the competitive landscape, and that’s what is happening in audit at the moment.” So who could be the competition in the future? The Accentures and IBMs of this world are in one group, and even Amazon and Google have been put in the frame. One of the Big 4 firms seems to be doing better than the others in this area. Just over half (52%) of those surveyed felt Deloitte was the best positioned to deliver when it comes to technology. That’s way ahead of KPMG (22%) and EY (18%). imposed,” he explained. That means inevitably some companies will be over-taxed and others undertaxed. Fullelove said many companies will not have the necessary information to arrive at a precise answer to how much DST they should pay. So, in practice, the government will have to rely on companies to arrive at a ‘best estimate’ of the amount of the DST payable based on a just and reasonable estimate of the UK revenues liable to DST. based bookkeeping to small and micro-businesses.” KPMG obviously doesn’t see this as a growth area, and is re-focusing the business on services that are core to the firm. A small number of staff (there were 200 working on this) will be used to manage the handover to alternative suppliers. zero-rating to digital publications will help support journalism. five years. In comparison, Germany AI start-ups raised $300m and French ones $400m. The news came as the UK government unveiled a national industry-funded AI postgraduate courses. New benefit for ICAEW PQs eading cloud accounting software provider Xero is partnering with ICAEW to offer all ACA, ICAEW CFAB and USS students the chance to complete the Xero Advisor Certification Equivalency Course – for free! It’s a great opportunity for students to gain highly prized accounting and tech skills. have completed the course you’ll get a certificate from Xero to show you are Xero Certified. You learn through real-life scenarios, client tasks and simulations and there are knowledge checks to help reinforce your learning. You need to register for the course (see below) and complete it within three months. aking Tax Digital (MTD) is an HMRC initiative designed to make sure the UK tax system is effective, efficient and easier for taxpayers. MTD for business (MTDfb) begins on 1 April 2019 with MTD for VAT. From that date, VATregistered businesses above the threshold of £85,000 will have to keep digital records and submit VAT returns using compatible software. Other components of MTD, such as income tax and corporation tax, have been placed on hold until April 2020 at the earliest. When does it all happen? There was a public beta programme in October 2018, leading to MTD for VAT going live in April 2019. What is Xero’s role in MTD? Preparing for digital tax starts with managing business accounts online – it makes the transition smoother and business more efficient. Having consulted with HMRC on MTD, Xero is committed to supporting small businesses and their advisers through the transition. • More efficient monitoring and management of the Aberthaw site, which covers a total area of 200 hectares (for example how to best store the coal to free up the most space). • Improved knowledge on the landscape around the site using aerial images, for example for vegetation management. • Providing valuable insights on the health and maintenance of the wider power station assets. While on site the multi-rotor drone was used to take photos of the wider site, allowing RWE to inspect the condition of assets that are high up and otherwise difficult to access. This, says PwC, is just one other use to demonstrate the benefits drones can have for businesses. PwC’s UK drone leader, Elaine Whyte, added: “Sectors with large assets in hard to reach areas are the most obvious starting points for expanding this kind of work further – from mining to agriculture and forestry.” She pointed out that a recent PwC report showed that drones have the potential to not only improve UK productivity, but to offer significant net cost savings for businesses to the tune of £16bn by 2030. PQ • Check out PwC’s report, entitled ‘Skies the limit: the impact of drone on the UK economy’. LAUGHTER & TEARS We blow a raspberry at the Oscars and blow the Brits out of the water! 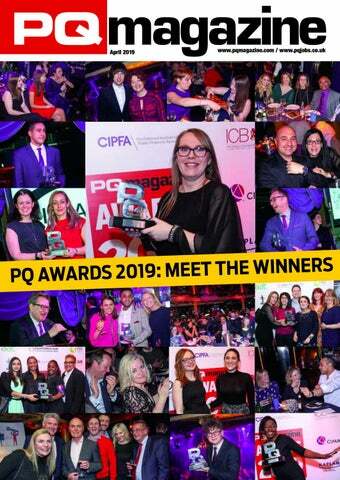 Yes, it’s the PQ awards 2019… The Café de Paris was filled with laugher – and a few tears – as the winners of the PQ magazine Awards 2019 were unveiled to the sound of Freddie Mercury and Queen. The coveted PQ magazine trophies have now wound their way home and are adorning mantelpieces around the world (Canada, at least). The queue to get into the Café de Paris started early this year, but it wasn’t long before the crowd discovered who had walked off with the top prizes. Our new PQ of the Year is Rebecca Dixon, an AAT trainee with the East Lancashire Hospital NHS Trust. Apprentice Zane Salmon was also on hand to pick up his award. He is on the Leadership Through Business programme with Grant Thornton and studies at Kaplan Financial. NQ of the Year went to CIPFA’s Sophie Medwell, who had to follow the awards on twitter, as she’s on secondment in Canada. PQ editor Graham Hambly chooses the Accountancy Body of the Year, and that went to the AAT this time around. CIMA’s Human Intelligence series, which has over 2.25m watches, won the Best Use of Social Media award. Among the editor’s other special awards winners were the UK (Only) ACCA Distance Learning (Independent Study Group) Facebook Group, and Avado for its work with Xero. A very special award was also presented on the night to Polly Thrasivoulou, after a few tears on both sides. The top lecturer spots went to MMU’s Yasar Zahid and Brigita Petrova, of LSBF, while the college awards went to All Inclusive Advice and Training, the University of Liverpool and Training Link. Comedian Tom Ward brought the house down as he hunted the room for the best dressed accountants (see page 30 for the pics). Luckily for all of us the top three were more than ready to give the packed house a twirl! Making a statement In the second of his two-part article, Tom Clendon looks at how the revised framework measures assets and liabilities, and considers the role or the statement of other comprehensive income. This stuff you need to know n last month’s article we saw that the IASB’s conceptual framework for financial reporting provides a set of principles on which International Financial Reporting Standards are based. The article explained that the framework had been revised and resulted in a new definition of the key elements of assets and liabilities and changed their recognition criteria. In addition, the revised framework also saw it extended. It lays down new guidance as to how assets and liabilities should be measured and suggests when they should be measured at historical cost or be revalued. The revised framework broke new territory in exploring the principles as to when gains and losses should be included in the statement of profit or loss and when in other comprehensive income. representation is to measure the asset at cost less depreciation. The role of other comprehensive income For the first time, the revised framework attempts to give guidance for the IASB to take into account when creating future standards that have to adjudicate on the classification of income and expenses between the statement of profit or loss and other comprehensive income. In principle, the revised framework has, as a default, that all income and expenses be included in the statement of profit or loss. However, it does acknowledge that there are exceptional circumstances where gains and losses should be included in other comprehensive income! It will be interesting to see in the long run whether this “clarification” actually results in changes to existing standards. Stephen Flatman explains the changes to the CIMA exams and outlines how they will affect you riven by the findings of our extensive and rigorous research programme into the future of finance, we launched our updated professional qualification on 31 January 2019. Over the course of 18 months, we consulted with more than 5,500 finance professionals from over 2,000 public and private organisations in over 150 countries through face-to-face interviews, roundtables and a global survey. Through this research, we brought together views from different types of organisations and businesses to get a solid understanding of what the world of finance needs now and in the future. From our discussions with these organisations and finance professionals it has become clear that finance professionals need to embrace technology and go beyond their conventional roles to drive impact, deliver solutions and create value. To reflect this, we have updated our professional qualification to help current members, students and future finance professionals do this right and successfully navigate the disruption brought by emerging technologies and digital transformation. We are committed to equipping you with the skills employers are demanding and the confidence to say, “I can do that”. performance (P) and financial (F) – across three levels – operational, management and strategic. The syllabus includes a total of nine subjects, which each cover a specific area of knowledge and content; all subjects interlink with each other to give you an unmatched set of knowledge and skills. At each level, your skills and competencies will be assessed in a Case Study exam, a real life business scenario and role play where you will need to demonstrate your technical, business, people and leadership skills and competencies. The changes we have made reflect the advances in the world of modern finance and business, and continue to meet the employability needs of both business and people. While we have kept the main structure, number, format and length of our exams, we have added new key areas such as technology, business models, integrated reporting, and cyber-security to our core accounting, finance, and business topics. At the Operational Level, we made significant changes to E1 Managing Finance in a Digital World, and added content around technology, data and information in a digital world and the changing shape and structure of the finance function. When you finish E1, you will know what it is like to work in a digital world and have a good knowledge on how to tackle the main challenges this working environment brings. Under P1 Management Accounting and F1 Financial Reporting we have updated the content to make it more digitally-focused in areas such as cost accounting, budgeting, and short-term commercial decisionmaking for P1, and areas such as managing cash and working capital section for F1. At the Management Level, we added an additional knowledge area around business models and value creation for E2 Managing Performance, to reflect the impact of digitisation on business models. Under P2 Advanced Management Accounting, we updated key areas such as managing the costs of creating value, capital investment decisionmaking and managing performance of organisational units to ensure you acquire digital skills fit for the modern business world. We also added integrated reporting as a new area in F2 Advanced Financial Reporting. technology and software. So far, conversations have focused almost exclusively on goods, but we ignore the services sector at our peril. Specifically on qualification, the UK currently adheres to and enjoys the benefits of the EU’s Professional Qualification Directive; members who are EU nationals are currently able to obtain access to relevant regulated accountancy roles across the EU with the minimum of barriers. With the UK poised to leave the EU single market, UK nationals may no longer be able to take advantage of this recognition system. We therefore support and urge continued collaboration between EU and UK regulators and professional bodies to allow the continued movement of professionals between the UK and EU countries, with the minimum of barriers. However difficult discussions in Europe are proving to be, it is important that the UK government and indeed Brussels maintain a willingness to compromise, collaborate and continue to have open dialogue with business about potential Brexit impacts and opportunities. This will reduce the risk of negative and unintended consequences and their potential impact on jobs, the economy and, ultimately, society. The current situation Resolving the Brexit conundrum remains the biggest issue the country has faced in modern times. Politically, Britain is locked in an impasse, creating massive uncertainty for business. Whatever happens up to and beyond 29 March, government must prioritise bridging the void that has developed between government and business, and indeed, wider society. * How do you want to receive your PQ magazine? Please tick your preferred mode of delivery for your free monthly magazine. Sign here ............................................................................Date........................................................... ▫ Please tick here if you do not wish to receive direct marketing promotions from other companies. PQ magazine reserves the right to refuse a free copy of the magazine if the applicant does not comply with the terms and conditions of circulation.We will use your details to send you a copy of the magazine and any further information we feel would be of use. favourites? The London Marathon website – I am running the marathon in April (my dream). Which websites do you use for work? PQ magazine, ACCA, AAT. How many hours a week do you spend in meetings? I spend a lot of time in the classroom lecturing students. A different type of meeting, but the one that is essential to my job. What time do you leave the office? I am a bit of a night owl so I like later starts and working later. If I’m working an evening then typically 9.30pm, if not 6pm. How do you relax? Kung Fu, running and yoga are favourites, but anything active and especially if shared with friends. What’s your favourite tipple? Red wine, on the rare occasion I get to party. How often do you take work home? Constantly, especially with student emails. What is your favourite TV show? LSBF TV, of course! Summer or winter? Summer. Pub or club? Both. Who is your hero? My father: super caring, smart and dearly loved by everyone. He taught me so much in my early years. I sadly lost him when I was 12. If you had a time machine, where would you go? I’d love to see the dinosaurs, live in the Mayan and Incan towns, or go to ancient Egypt when the pyramids were built. But being a true management accountant I would most like to travel into the future, some 200 years or so from now! If you hadn’t chosen teaching, what else might you be? A Kung Fu instructor. trusted employees will exercise good judgement in this regard! Gradual progress The UK has made ‘gradual progress’ on the Women in Work Index, rising to 13th place this year, according to PwC. The Big 4 firm said that increasing the UK’s female employment rate from 57% to Sweden’s 69% could boost GDP by £178bn. Scotland, the South West and Wales rank as the top three regions based on five indicators of female empowerment. The bottom two places in the UK are occupied by the East and West Midlands, primarily due to high female unemployment rates. No Brexit deal expected Nigh on three-quarters (73%) of finance professionals believe that a no-deal Brexit is a ‘very’ or ‘quite’ likely outcome, according to a new survey from ICAS. Just over half (56%) of the same finance professionals said that their organisation is prepared for a no-deal Brexit. Only around one in three, however, believe that the UK will formally leave the European Union on the appointed date of 29 March. reached this decision. Pokorowski, a self-employed electrician, became homeless in 2014, so missed a return filing deadline in April 2015. He slept rough until finding a homeless shelter in December 2016. By February 2017 HMRC fines had built up to £1,600. The judge noted that within three months of finding a permanent home the accused filed the tax return. NEW TAX ON ‘PEOPLE OF MEANS’ Starbucks CEO, Howard Schultz, has CLOTHING? Former complained about people calling him a billionaire. Fashion retailers and manufacturers could be forced to pay a levy on each item sold in a government effort to reduce the 300,000 tonnes of clothing that finds its way each year to incineration plants or landfill sites. The plans also include the introduction of a deposit scheme for bottles and cans and free food waste and gardens rubbish collection for every home. Rather than using such an expression he wants you to use ‘people of means’ or ‘people of wealth’. The Guardian columnist, Arwa Mahdawi, warned that Schultz should be careful what he wants. After hearing his suggestion many people put forward their own alternatives, including ‘robber barons’, ‘cash vampires’ and much worse. A French court has fined Swiss investment bank UBS a record €3.7bn for encouraging its wealthy customers to avoid their taxes. The Paris criminal court also ordered the bank to pay an additional €800k to the French government. The fine in effect wipes out UBS’s €4.32bn ($4.9bn) net profit for 2018. GOT THE L OT The School of Life How are you doing in the School of Life? We have a collection of three books that should help you move to a mindfulness world. The three books look at how to thrive in the digital age, how to worry less about money, and simply how to stay sane. Together they would set you back £24, but you can get a set for free right here. To enter send your name and address to graham@pqaccountant.com. Put ‘School of Life’ in the heading and you could one of the lucky three readers who win all three books. Terms and conditions: One entry per giveaway please. You must send your name and address to be entered for the draw. All giveaway entries must be received by Friday 12 April. The main draw will take place on Monday 15 April 2019. Your jobs board I need to find pqjobs.co.uk now!